Remember this last night in my old home office? Well, as I sit and type these words, I am now cozily ensconced — as only a closet can cozily ensconce you — in my new one. It’s much smaller with a tiny fraction of storage compared to my old office…my old office being an actual room and this being a former closet. Be that as it may, I am beginning to love my new space. We knocked down the innards for two facing cabinets and built two facing desks in its place, with shelving above. It is still at its infancy, so much organization and some purposeful beautifying is in order, but I can see the potential. Already I feel at home here. My work desk is on one side, with my work laptop sitting at the ready, the printer on the shelf above. My personal laptop is on the other desk, cookbooks slowly being transferred to the shelf above, along with my trusty camera. My swivel chair sits jauntily in between. When I look to one side I can see myself working in the full-length mirror that we decided not to remove. I give myself a little rah-rah grin and get back to work. Though still surrounded by things that have yet to find their official places, I feel energized and inspired by this new space. Maybe because I knew, at heart, that the old space was always a shared space…and this new one is, not to put too fine a point on it, all mine. So it’s off to pinterest I go for ideas and inspiration! Meanwhile, in the kitchen…guanciale. Enough to inspire anything. – Blanch the broccoli and fava beans in boiling water until just tender. I use frozen mini fava beans which need minimal blanching so I chuck them in the water when the broccoli is almost tender. – Heat a skillet over high heat. When hot, drizzle in a bit of olive oil. Not much because the guanciale will render its fat. You just want something to get it going. Now toss the guanciale in and let it render. Sauté until its fat is rendered and the guanciale is tender and a bit toasty. 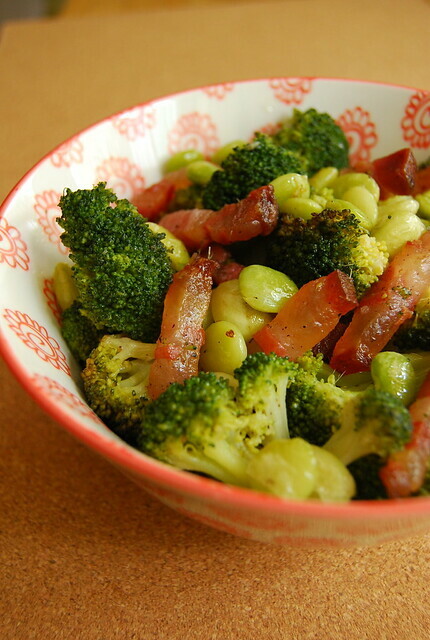 – Toss in the beans and broccoli. Sauté, tossing a couple of times, until the vegetables are a little burnished in places. Season with salt and pepper. Serve immediately. This makes for a quick side dish, but also a meal in itself, tossed with some pasta and crowned with a generous grating of Parmesan. I have eaten this just heaped on a mound of brown rice and have been equally happy. At this point I’d also like to say that I try to always have blanched or steamed broccoli in the fridge, prepared and at the ready of dishes such as this. Or even just to eat, heated slightly, and tossed with a smattering of sea salt and the best olive oil I can find. I could eat that by the bowlful, with my hands. It is one of my best ways to have broccoli. I’d also like to qualify that, although I love most vegetables fresh, there are a couple, like green peas and these mini favas, that I sneakily stash away in my freezer at all times. They make a failsafe rescue for all veggie emergencies. Also, I love green peas to delirium. Really. And that being said, I’ll add here that this dish would be fantastic as well with peas in place of the favas. If anyone has any other suggestions for preparing guanciale please share! Also, if you have suggestions and ideas for fixing up an effective, albeit tiny, home office do share as well! I love how fresh and yet indulgent this dish is 🙂 I definitely won't feel guilty eating fatty cured meat here 🙂 I'd love to have this with a big bowl of spaghetti in butter. Hihi! I love how this mix of green veg and rich, fatty guanciale results in a wholesome dish with some seriously indulgent flavor. 🙂 And I like the notion of tiny home-offices, too! Hi Midge! It's all in the balance 🙂 If you have tiny home-office tips feel free to pass them along! Hi, Joey! What laptop model/brand do you use for work and personal stuff? I read your interview in The Spoiled Mummy and there was a photo of your laptop and it looked to.me you’re using Windows? Im scouting for a good laptop for work and I need aWindows-based one. Thank you, and more power!